After consecutive weekends with $60+ million openings, a scorching November box office campaign should sustain momentum this week thanks to the release of two high profile titles. 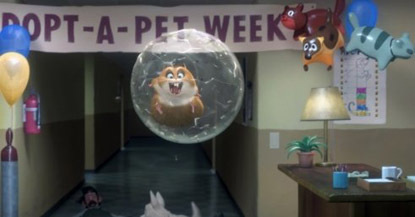 Disney's latest 3-D animated family film, Bolt, won BOP's heart many months ago with the release of its winning trailer featuring our favorite hamster-in-a-ball, Rhino. We expect the rest of North America to catch up with us on the point this weekend. Meanwhile, teen girls and cougars are swooning over the release of Twilight, the latest romantic take on a teen girl in love with the gothic darkness. BOP loves TV's Bolt, but man's best friend is no match for lovelorn vampires, we fear. Last month, the staff at BOP had a group discussion regarding Twilight wherein we collectively threw our hands up in the air and said, "I have no idea." The column is available for your perusal here. I will also let the introduction for that column serve as the background data for Twilight rather than regurgitate it here. Frankly, if you didn't know what Twilight was already, you don't care what happens next. If you were already a fan, you don't need the back story anyway, just the box office evaluation. The gist of it is that our range was as broad as possible when we had this discussion just a month ago in mid-October. Some people believed a $20 million opening was in the cards while others went as high as mid-$50s. At this point, all of these predictions appear to be potentially low. Even the harshest critics of the project at the time have acknowledged that they had low-balled demand for this title, and the reason why is obvious.